Browse for sprockets by vehicle make and model. 1-3/4" OD, 9mm x 13mm ID. Fits 13mm OD dual-flatted motor shafts with nut and washer on end to secure sprocket in place. Made from hardened steel with a black oxide finish. 1-3/4" OD, 12mm x 17mm ID. Fits 17mm OD dual-flatted motor shafts with nut and washer on end to secure sprocket in place. Made from hardened steel with a black oxide finish. Compatible with MY1020Z gear motors. 1-7/8" OD, 8.5mm x 10mm ID. Fits 10mm OD dual-flatted motor shafts with nut and washer on end to secure sprocket in place. Made from hardened steel with a black oxide finish. 2-3/8" OD, 9mm x 13mm ID. Fits 13mm OD dual-flatted motor shafts with nut and washer on end to secure sprocket in place. Made from hardened steel with a black oxide finish. 141mm (5-5/8") OD, 54mm (2-1/8") ID. Adjacent bolt holes are spaced 47mm (1-3/8") apart from center to center. 64.5mm bolt circle diameter. 6mm bolt holes. Made of zinc plated steel. 4 bolt mounting pattern. Bolts directly onto 4 hole and 16 tooth rear wheel freewheel clutches. All Group 1 (G1) axle sprockets and hubs are compatible with each other. 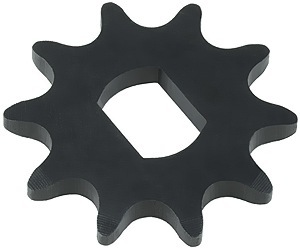 36 tooth aluminum sprocket. 6.015" OD, 2" ID, 2.875" bolt circle diameter. Four 3/8" ID bolt holes. Made of aircraft-grade tempered (hardened) aluminum alloy. 48 tooth steel sprocket. 7.928" OD, 2" ID, 2.875" bolt circle diameter. Four 3/8" ID bolt holes. Made of zinc plated steel. 54 tooth steel sprocket. 8.884" OD, 2" ID, 2.875" bolt circle diameter. Four 3/8" ID bolt holes. Made of zinc plated steel. 57 tooth aluminum sprocket. 9.362" OD, 2" ID, 2.875" bolt circle diameter. Four 3/8" ID bolt holes. Made of aircraft-grade tempered (hardened) aluminum alloy. 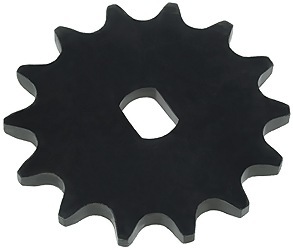 60 tooth aluminum sprocket. 9.840" OD, 2" ID, 2.875" bolt circle diameter. Four 3/8" ID bolt holes. Made of aircraft-grade tempered (hardened) aluminum alloy. 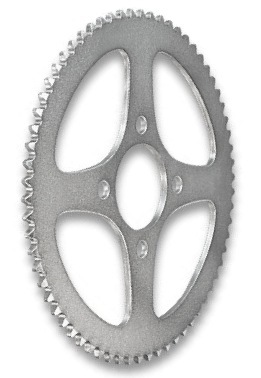 64 tooth aluminum sprocket. 10.478" OD, 2" ID, 2.875" bolt circle diameter. Four 3/8" ID bolt holes. Made of aircraft-grade tempered (hardened) aluminum alloy. 68 tooth aluminum sprocket. 11.115" OD, 2" ID, 2.875" bolt circle diameter. Four 3/8" ID bolt holes. Made of aircraft-grade tempered (hardened) aluminum alloy. 72 tooth aluminum sprocket. 11.752" OD, 2" ID, 2.875" bolt circle diameter. Four 3/8" ID bolt holes. Made of aircraft-grade tempered (hardened) aluminum alloy. 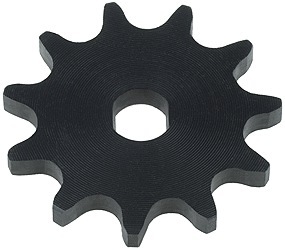 80 tooth aluminum sprocket. 13.026" OD, 2" ID, 2.875" bolt circle diameter. Four 3/8" ID bolt holes. Made of aircraft-grade tempered (hardened) aluminum alloy. 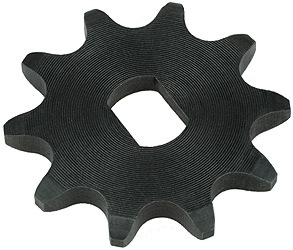 85 tooth aluminum sprocket. 13.822" OD, 2" ID, 2.875" bolt circle diameter. Four 3/8" ID bolt holes. Made of aircraft-grade tempered (hardened) aluminum alloy. 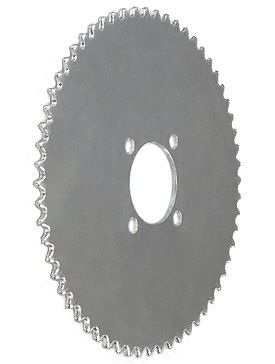 90 tooth aluminum sprocket. 14.618" OD, 2" ID, 2.875" bolt circle diameter. Four 3/8" ID bolt holes. Made of aircraft-grade tempered (hardened) aluminum alloy. Zinc plated steel sprocket hub. 3/4" ID bore. 3/16" keyway. Four 3/8" ID holes with 2.875″ bolt circle diameter and four 1/4" ID holes with 3.228″ bolt circle diameter. Includes two setscrews. 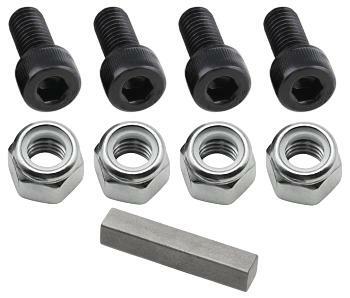 Four 3/8" OD x 3/4" long socket head bolts with nuts. Two set screws. One 3/16" x 3/16" x 1-1/4" keystock. Compatible with item # HUB-201340 sold above. Zinc plated steel sprocket hub. 1" ID bore. 1/4" keyway. 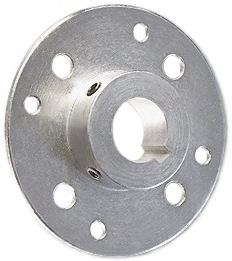 Four 3/8" ID holes with 2.875″ bolt circle diameter and four 1/4" ID holes with 3.228″ bolt circle diameter. Includes two setscrews. Zinc plated steel sprocket hub. 1-1/4" ID bore. 1/4" keyway. Four 3/8" ID holes with 2.875″ bolt circle diameter and four 1/4" ID holes with 3.228″ bolt circle diameter. Includes two setscrews. Four 3/8" OD x 3/4" long socket head bolts with nuts. Two set screws. One 1/4" x 1/4" x 1-1/4" keystock. Compatible with item # HUB-201100 and HUB-201114 sold above. 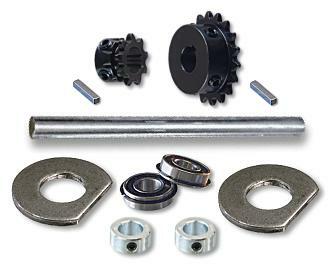 Weld-on jackshaft kit with 8 tooth and 17 tooth sprockets for a 53% increase or decrease in gear ratio. 10" long 5/8" OD jackshaft with keyway. 8 tooth and 17 tooth sprockets with keyways, two keys, two precision sealed ball bearings with snap rings, two weld-on bearing hangers, and two axle collars with set screws. This is a complete kit that contains everything needed to install a weld-on jackshaft.